As the book opens, "Kal-El" is ruminating Supergirl and the problems she and Power Girl have caused as "Flamebird" and "Nightwing". He thinks, perhaps, that they want to be "saved" and is going to set about doing exactly that. "Kal" and some of his minions set about torturing some of the citizens of Kandor, trying to learn of Kara's location (incidentally, this happens outside of a building that is probably supposed to say "Eat at Joe's" in Kryptonian, but instead for some reason says "Cat at Jac's"). We cut to Kara who's in the shower with a clear shot of her tattoo. She's feeling tortured over what she believes her father told her about sending her to Earth to kill the real Kal. Power Girl arrives and tells Kara that she thinks she's "losing her", and that if she goes over the line and takes a life, she'll never let her leave Kandor. To which Kara replies that she hopes Power Girl would be strong enough to keep her there. "Kal-El", meanwhile, has found the alien who gave Kara her tattoo, wherein he reveals that he survived "the crisis" and makes fairly unsubtle remarks that he's actually Ultraman, the ex-leader of a "syndicate", and his hate has been transferred to love. He tortures the alien, and burns Kryptonian words into his skin at the request of "Holy Mother", who he seems to be in telepathic communication with. 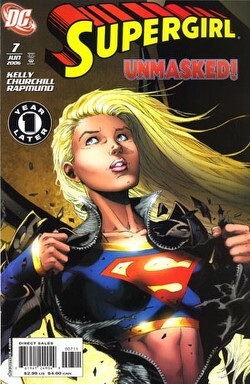 Supergirl and Power Girl meet with some other members of the resistance, where Kara's motivations and beliefs are again called into question. Kara just wants to get to a fight, but the resistance fella tells her that all soldiers share a final desire to lay down arms, which Kara doesn't seem to share. "Kal-El" (Ultraman) suddenly appears on a video screen with the burned and mutilated alien, calling out Nightwing and Flamebird and saying that "until they throw themselves on the mercy of the church of El," he will kill one hundred more aliens every ten minutes. As he's about to kill the first batch, Supergirl and Power Girl arrive and carry them to safety. One of them either kills herself or was some sort of robot-bomb (it's unclear) and explodes, to which Ultraman replies that it's a pity because he wanted to "save" them. Of course Supergirl and Power Girl aren't dead, and they gain the upper hand on Ultraman. Kara starts savagely beating him as Power Girl is occupied with his minions. Kara tells Ultraman that he's perverted the name "Kal-El", because the real Kal-El is a good man. She then flashes back to her father telling her to kill the baby Kal-El again, her confusion over her real purpose, and her telling Clark that she was leaving because if she didn't, she thought she'd kill him. All of these thoughts and emotions bombard Kara at once as she seems about to kill Ultraman, when suddenly an apparent telepathic communication enters her thoughts and asks her if that's really what she wants to do. It asks her if she wants to use her energy and passion simply to kill, and she says no. She takes her helmet off, astonishing all the gathered aliens that she's not one of them. Ultraman then asks her what she wants from him that only Kal-El can give her. She asks him to save her and she kisses him as Power Girl looks on in horror. Watching from high up on a balcony somewhere is a woman with long red hair and a planet with a ring around it on her chest, who says that she finally got what she wanted, which was a "good match" for her son. Story - 3: This book's cover date is, AGAIN, a month behind the month it was actually released in. Not cool. And... I am so, so confused. First Kara's upset about Argo and thinks there's a way back to it through Kandor (Issue 6), and now that gets barely a one-line mention and she's suddenly tormented by thinking her father sent her back to kill Kal. Who she won't kill, because he's a good man, and she apparently wants to have inbred babies with him. Instead, she'll settle for Ultraman, deposited in Kandor due to Infinite Crisis, who has apparently been adopted by Saturn Queen from the "Superman/Batman" story arc, "Absolute Power". And we can thank Infinite Crisis for her involvement, too. So... yeah. What the hell? This book gives me what I've been longing for, character depth for Kara, but it doesn't jive with the depth Rucka established in issue 6. It's incongruous, which I'm sure is mostly attributed to having to change writers mid-story, but still. The kiss at the end (while being questionable due to Ultraman's words implying that what Kara really wants from the real Kal-El, her cousin, is a romp in the sack) also seemed to come out of nowhere. I can buy that she's tormented over her father's words and not wanting to kill Kal. But I don't buy that she would suddenly decide that all of that made her want to have his superbabies. Perhaps it's a ruse or something (which we'll find out in about, oh... three months when the next issue comes out) in which case I may have less of a problem with it. Perhaps during Saturn Queen's communication with her she picked up on her thoughts that Kara would be a good match for her "son" and so is playing along. I could buy that. But if it was supposed to be genuine as the result of confusion, I wouldn't buy that for a nickel. Also odd was that Saturn Queen was talking, and Saturn Girl (the original Legion character that Saturn Queen is a bad alternate-reality version of) has never been able to. But perhaps she was talking back in the "Absolute Power" arc in "Superman/Batman", I don't remember. Either way, not a very big deal but I thought it worth a mention. She could have just as easily been thinking the words on the page instead of saying them, as she wasn't talking to anyone but herself. So, the book is incongruous with the last and I can't help but think they could have tied it together a little better. Why was Kara looking for a way to Argo via Kandor? Why did she think it was still out there? I want these questions answered and not forgotten about. I like the development, but now how it differs from the development of the last book which didn't mention Kara's father or the possibility of her being sent to kill Kal at all. It just doesn't seem to... flow, I guess. I'm sure that's mostly the change in writers, and hopefully from here on out it'll get more cohesive. There's a good story here, actually, it's just this issue's execution of said story that I find problematic. Art - 4: This is about as good as Churchill gets, in my opinion. Saturn Queen had a different face from Supergirl (hooray!) but Power Girl and some of Ultraman's minions didn't (boo!). Adequate, but kind of like Kara, lacking in personality. Well okay, Kara's got some personality now. What exactly that personality is just seems to change from issue to issue. Still not really my cup of tea, though. Cover Art - 4: Okay, I lied. THIS is as good as Churchill gets. It's an iconic cover with a great take on the shirt rip, and it kinda sorta happens in the issue (if you replace "shirt" with "helmet" and "rip" with "slowly remove"). If this exact cover were done by, say... Ed Benes, I'd give it a 5. No, not a 5. A 6! You watch, I would. And I'd blow it up to poster size and mount it to the ceiling above my bed so I could look at is as I fell asleep every night... you should probably forget you just read that.